Manufactured in 1996 with a wide serrated trigger, wide serrated hammer, fixed front ramp sight with orange insert and adjustable white outline notch rear sight. 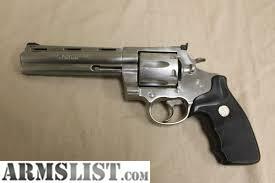 The left side of the barrel is marked "COLT ANACONDA4 44 Magnum-". Fitted with checkered Colt Rubber grips with silver Colt medallions. Slight but visible cylinder drag line. Overall exterior excellent. Mechanically excellent.